Winter will officially arrive in just a few days, and you never know what to expect in the Atlanta area. When you own a commercial business, it’s always best to be prepared for whatever Mother Nature may bring your way. The roof is one of the most important components of any structure, so you want to ensure it’s ready for rain, snow, sleet, high wind, or whatever type of weather may occur. Our Atlanta commercial roofing experts have a few tips to help you relax, knowing your business is prepared for the winter season. 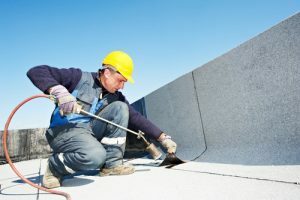 First and foremost, be sure to have your commercial flat roof inspected. You can only see so much from the ground, and even if you get on the roof (which isn’t recommended), you don’t know what to look for like professionals do. It’s vital that any potential damage or issues are addressed before winter sets in, including gaps, loose or open seams, cracked caulking, punctures in the membrane, rusted flashings, etc. Consider the areas surrounding your facility. From other buildings to trees, there are things you may not even think of that can impact your facility during winter months. Nearby buildings may be a source of additional snow on your roof, if the snow drifts or blows. Tree limbs can become extremely heavy when covered with ice, sleet, or snow – another potential hazard if trees or their limbs are close to your roof, or overhanging it. Clear away debris from the roof and gutters. Water has to have a place to go so it doesn’t end up causing damage or leaks, whether it’s from rain or melting ice/snow. Be sure sticks and branches, leaves, or other debris are cleared away from gutters and downspouts. It’s important to be prepared before winter sets in, however, problems can develop, even when you’re vigilant – especially if your commercial roof is older or worn. Make sure you have adequate insurance coverage, and that it’s up-to-date. You’ll also want to check your roofing system’s warranty so that, in the event of damage, you’ll know what is or isn’t covered. When it comes to commercial roofing in Atlanta, count on Kelco for all of your needs – from installation and inspection, to repair. We’ve been serving businesses in the area for almost 45 years; you can trust our professionals for quality, affordable service. Give us a call, today!